Window sensors, much like door sensors, work using a reed switch and a magnet. The reed switch attaches to your window frame, and the magnet attaches to the window itself. When a window with an active sensor is opened, the magnet pulls away from the reed switch and the alarm. The reed switch typically needs to be within an inch of the magnet to work effectively. When set up correctly, a window sensor is an extremely reliable tool to monitor intrusion points throughout your home––so long as you change the batteries routinely. How do window sensors work? Because windows are obvious points of entry for potential intruders, window sensors are an essential part of a complete home security system. 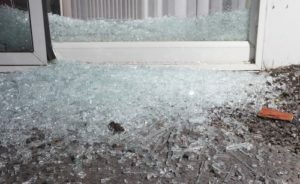 When a window in your home is breached, the sensor sets off a deterrent alarm—one typically loud enough to scare off burglars when you’re not home. Some sensors have an alarm setting and a chime setting, the latter of which can be used when you’re at home. Modern sensors can even remotely notify you through your smartphone. Most window sensors consist of two pieces––a magnet that fits on your window and a reed switch that rests on the window frame. The reed switch houses a circuit that is controlled by the proximity of the magnet attached to the window. When your window is closed, the magnet is close enough to the reed switch to close the circuit. When the window opens, the magnet pulls away and opens the circuit, causing the window sensor to react. Window sensors take only a few minutes each to install. They typically come with an adhesive strip on the back to make the setup simple. Some also come with small screws, but you could always buy adhesive strips to minimize the damage done to your windows. First, place the larger half of the sensor on the window frame, lined up parallel with the closed window itself. Then place the smaller half of the sensor right next to it on the window. Most sensors need to be less than an inch apart to work effectively. You should test the sensor a few times after installing it to ensure it works consistently. When installing window sensors, place them strategically so they can’t be seen or tampered with from outside of the home. For a more in-depth look at window sensor installation, take a look at our installation tips and tricks for door sensors, window sensors, and other sensors we recommend having throughout your home. Alarm settings: Most sensors offer plenty of volume in their alert settings, but if you want an alarm capable of waking you from a deep sleep, check the alarm decibel level. Plenty of alarms reach volumes above 100 dB, which equates to a jet takeoff, power lawnmower, or a loud motorcycle. Remote notifications: Some modern window sensors sync to your mobile phone and notify you whenever there’s an entry. That way, even if you’re far from home, you can quickly alert the authorities of a break-in. Keycodes: Savvy burglars can sometimes find a way around basic window sensors. But a sensor with a built-in keycode prevents them from disabling the alarm before entering your home. Installing DIY window sensors is a great step to make your home safer, but for a more comprehensive solution, look into installing a home security system. Most home security systems will set you up with cutting-edge intrusion sensors as well as security cameras, improved locks, and the option for more advanced security features. We’ve put in a ton of research to determine our picks for the best home security systems out there.